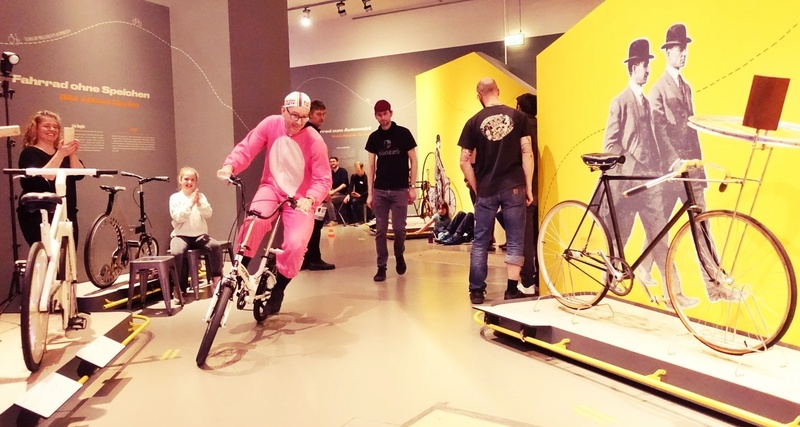 I have started to buy, repair, restore and sell old bicycles just a few month ago, mainly as a hobby to spend the long cold winter days in Bremen doing something meaningful. 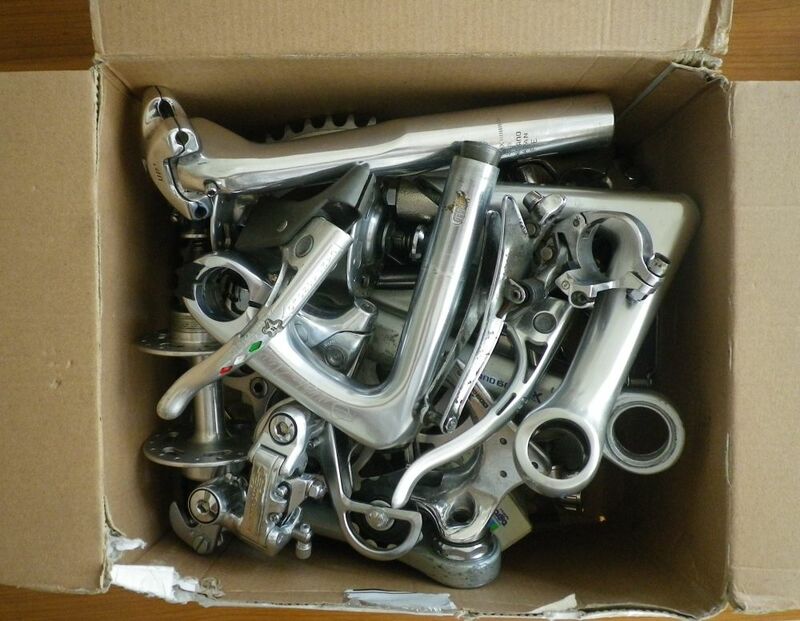 But even in a few months quite an assortment of interesting bike parts has gathered. 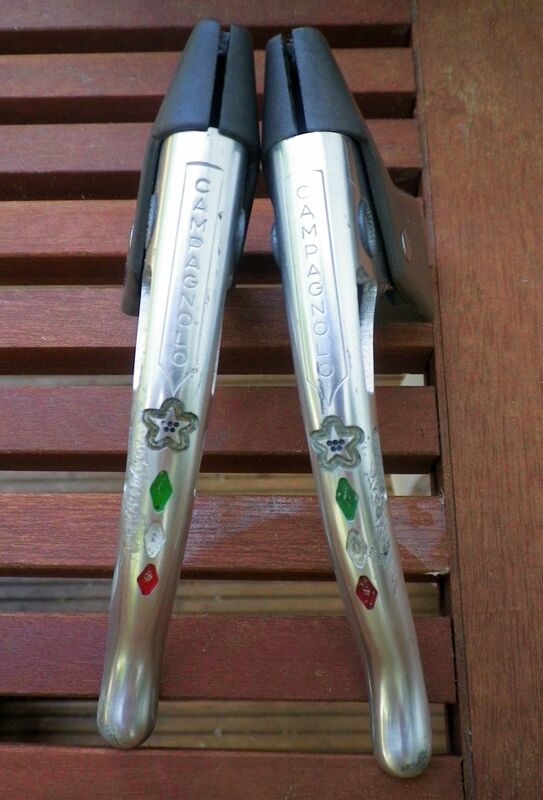 Shimano's Golden Arrow series, the predecessor from the Eighties of today's 105 series is one of my favourites. So is the Shimano 600 Arabesque series, which is slightly older and influenced by arabic design elements, something not that much in vogue today. 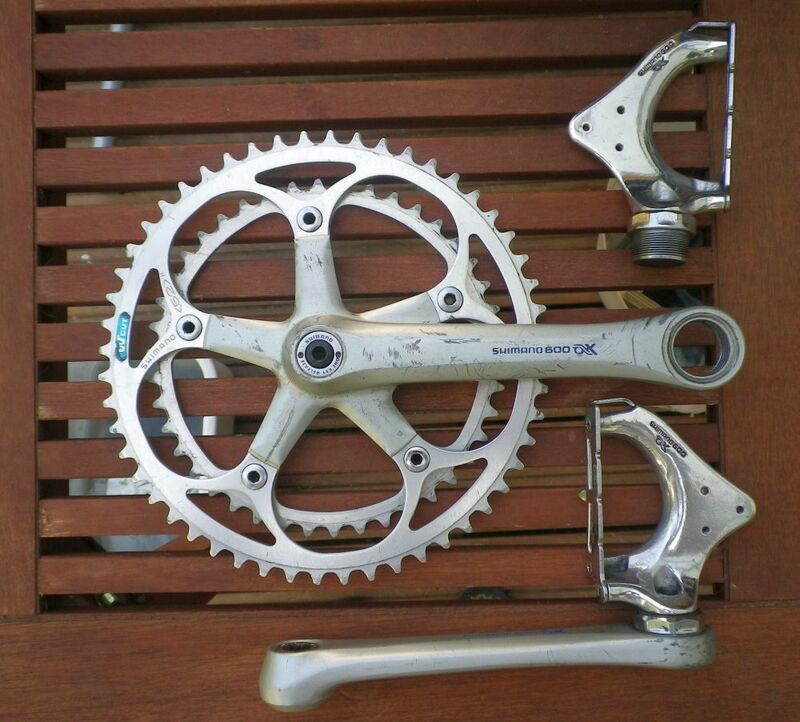 Generally I prefer Shimano over Camapgnolo: Less model changes, cheaper and easier to get and better functionality. "Cheap" is important, as I repair the components and assemble them on my frames, making a lot of mistakes. So if something goes wrong, I don't loose a lot of money on the spot. Today, for example, I learned that a 1'' cone for a headset that is mounted directly on the fork can be different depending on the type of fork. There goes another headset. I bought also some components from lesser know brands. My Lyotard pedals are a good example, my Maillard and Normandy high flange hubs, a Modolo Stem (with the Mosburger Logo) and a very nice ITM stem. Before I repair, adjust and clean all of this stuff, I keep it in a box which is the big box of small wonders. 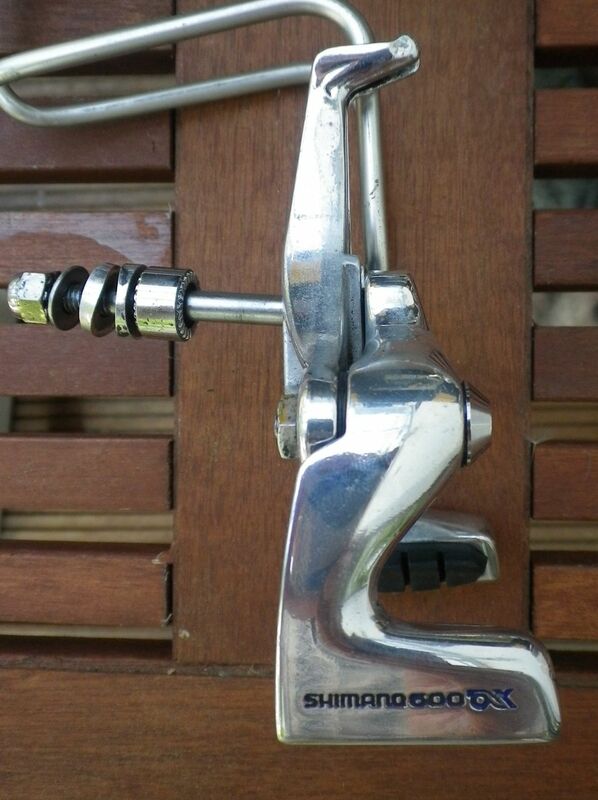 Now one of my recent purchases has been a complete set of Shimano 600 AX components. 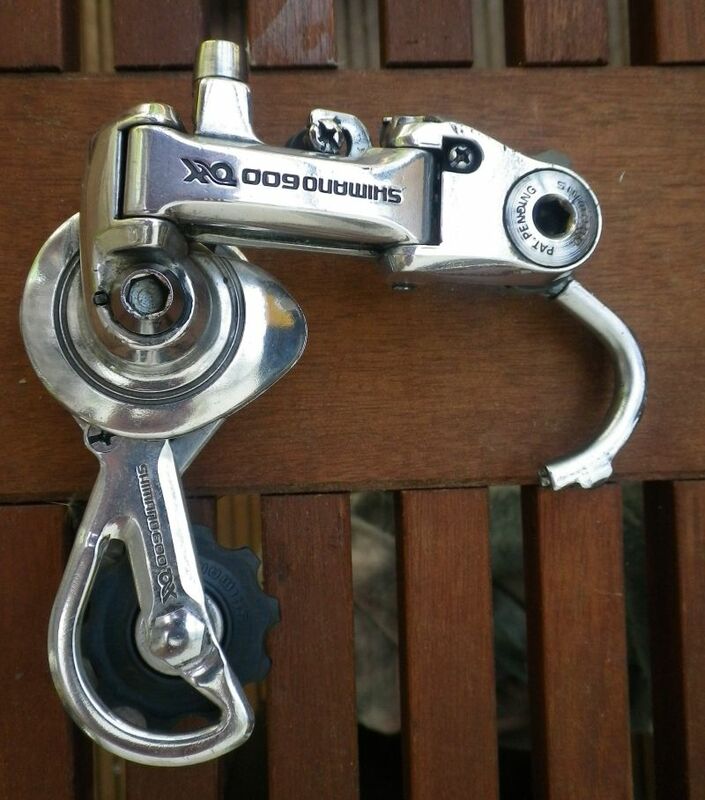 Shimano launched the 600AX group in 1981 in response to the aerodynamic craze in cycling. In many respects I feel it is the equivalent to the Japanese bubble economy era: Bold, gaudy, baroque in design, expensive looking and not really useful. 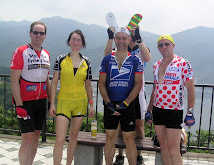 Take a look at the bottle cage for example: This one is designed for a special aerodynamic bottle that is much higher than wide (not a circular section) so that it offers less wind resistance. (By the way, if you own such a bottle, please let me know). Nice. But basically useless. And of course Shimano wasn't able to set a new standard. The same is true for the crank set. 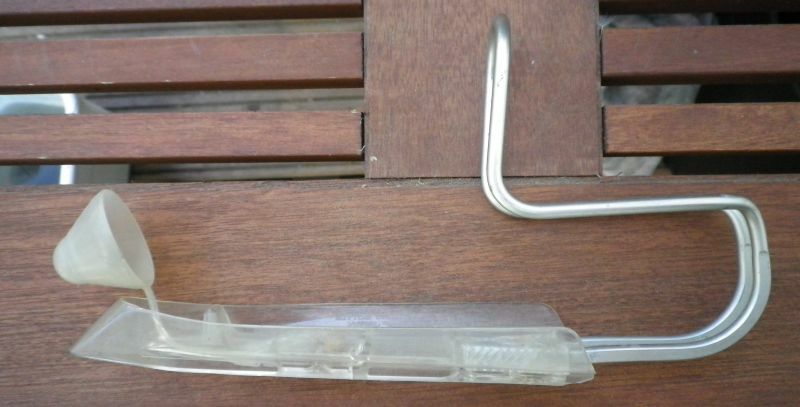 Shimano tried to set a new standard for a new, bigger pedal thread. They failed to convince the world. Today it is extremely difficult to find matching pedals. 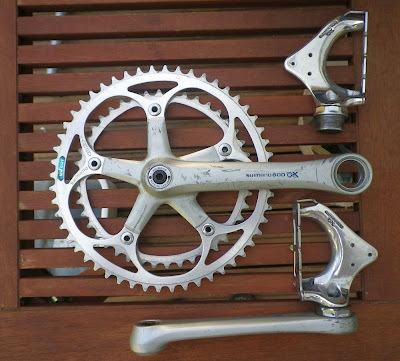 In theory this would allow me to completely retrofit a frame with Shimano 600 AX with the exception of head set, bottom bracket and chain, as there were no 600AX parts developed in their cases. Theoretically, as some of the components are in bad shape (rubber hoods of the shifters for example) or not that practical. Take for example the brakes. These are probably one of the most beautiful bicycle brakes ever designed. 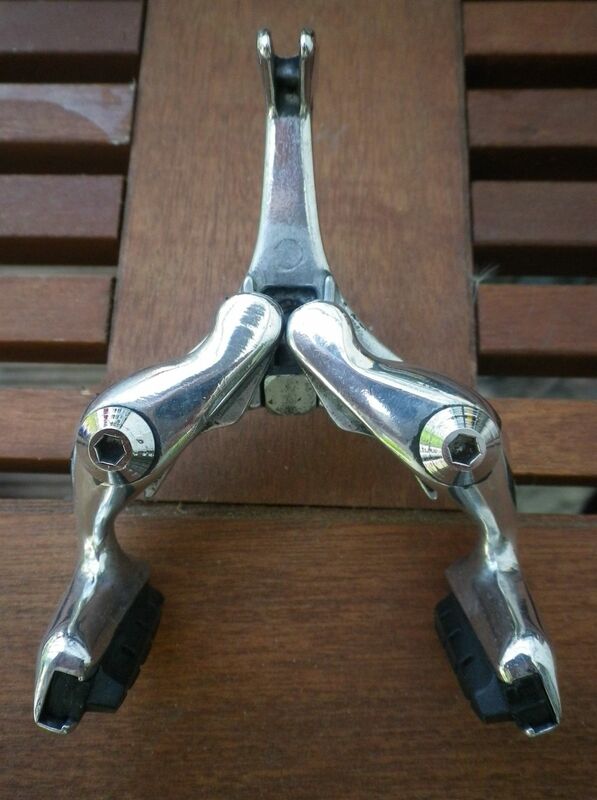 Some people say this about the Campagnolo Delta brakes but I would disagree, they look comparatively bulky. Both, Shimano AX and Campa Delta brakes have two things in common: They are incredibly difficult to mount and to adjust and, even worse, they tend not to brake too much. Here are some more nice components. 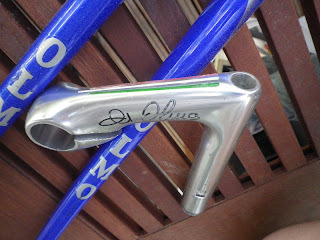 Some of them I will use to built up two Olmo frames I have purchased recently. These are replacements for the Moser Leader AX evolution frame I wanted to work on some month ago but that turned out to be too small for me. Yes, Olmo is the brand of choice for the time being. But today the weather is beautiful an daylight until 9 PM allows me to go riding after work and early dinner.